I was walking my daughter to school last week when she handed me a flannel flower. I jolted with surprise and was transported to my childhood. I was six years old, standing in a vacant block in Hawks Nest surrounded by flannel flowers, while my grandmother snapped photos. Nan loved flannel flowers. You don’t see them much these days. They’ve disappeared from all the vacant blocks in Hawks Nest. It’s strange that Sprog 2 found a lone plant at a bus stop in Sydney. Yesterday was the second anniversary of my grandmother’s death. I spent the afternoon searching through the boxes of slides that were part of my inheritance (oh, how I loved “slide night” during holidays with my grandparents) for this image, which had been haunting me for days. When I found it, tears sprang to my eyes, the ones I held back when my daughter handed me that precious flower. I still miss my grandmother very much. She’s reverted in my memories to around age 70. I’d call her every Sunday to tell her about my week. She’d pick up the phone and say “Hello darlin” (or was that George the cockatoo?) Whenever something happens in my life, I still feel an aching need to tell her. Her telephone number is always popping into my head. But she’s not there to answer my calls. My family are driving to Hawks Nest in a few weeks time. It will be my first visit since the funeral. We’re scattering her ashes in the river beside her old house. Mum finally feels ready to let her go (we’re scattering Pop’s ashes too, so they can keep each other company). But for now, in her honour, I’m reblogging my tribute from last year, it’s called “So Long And Thanks For All The Fish”, plus two photos (above) I found slotted side-by-side in one of her little plastic albums. 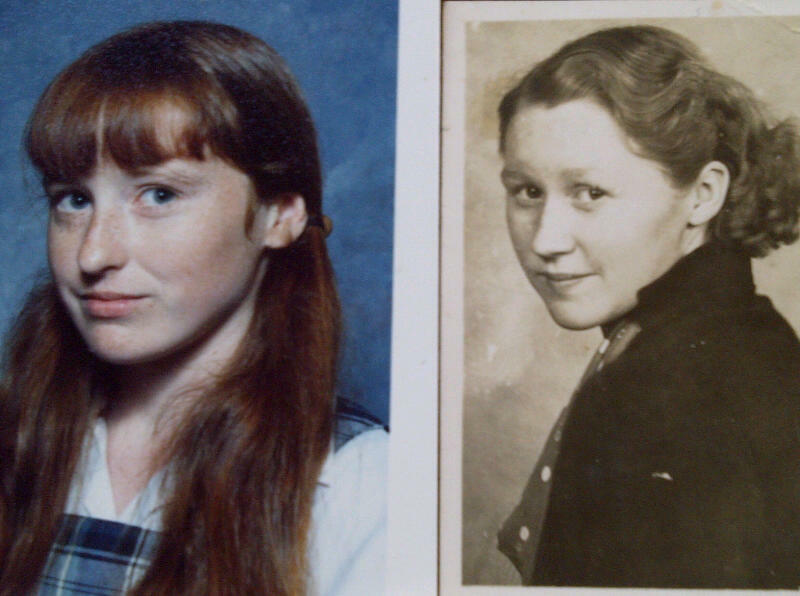 It’s me and Nan as teenagers, she must have noticed the resemblance and placed the pics together for posterity. “A year ago today, my Nan died. Well, her body died; her mind departed long before. I miss my Nan so much. She was awesome, before dementia stole her spirit. For months after she died, I wanted to ask a psychic how she was doing – whether she got her marbles back. But lately, I’ve been feeling her close by, so I reckon she’s found them (and me). I’m not normally the ooky-kooky type, but I’ve started making her favourite facial expression. She had this habit of giving you an exaggerated grin, with scrunched up eyes and a wrinkled up nose, when she caught you looking at her. For some reason, I’ve started doing that with the Sprogs. Earlier this year, I contemplated starting a blog along the lines of “The year I lost my Nan and found her again”. I was going to introduce the Sprogs to all the cool things Nan did with me. Like making our own meat pies on dinner plates and decorating them with the homemade pastry off-cuts. And the heart-attack-inducing slice she prepared every time we came to visit – biscuit base, caramel filling, Dessert Whip topping and sprinkles. 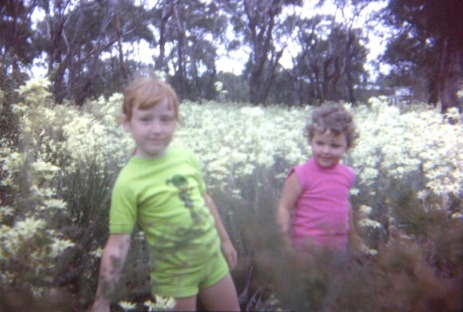 Or searching for the long-lost fields of flannel flowers she’d make us pose for photos amid in our unflattering ’70s polo-neck skivvies and flares. Or packing a picnic of cold pie and heart-attack slice and wandering along Hawks Nest beach to the base of Mount Yacaba to hunt for cowrie shells in the rock pools. Or filling an old wash-tin with sand and salt water, then adding guppies and brightly clawed crabs caught among the mangroves on the riverfront. Or buying mullet and bream from a local fisherman, tossing them in flour and Season-All and frying them with hand-cut chips in well-used oil. Or growing peaches and plums and lemons and mangoes and mulberries in the backyard and eating them straight from the tree. Or cultivating a mysterious and overgrown “fernery” to explore down the side of the house. Or waking the Sprogs at dawn to swim in the Myall River during a chilly king tide. She was a funny old stick, my Nan. A total penny-pincher yet incredibly generous at the same time. She’d wash and reuse all her plastic bags, complain bitterly about the price of absolutely everything, yet thrust money into my hands on every visit. My sister and I spent every school holiday with her, while Mum and Dad worked. She fed us so much junk food we’d get heartburn. She let us watch so much TV our eyes went square. Because Mum was allergic to fur and feathers, Nan would buy us holiday pets – guinea pigs, ducklings that mysteriously grew into geese, cockatoos. Then she’d be left to tend them when went back to school. Nan was so proud when I became editor of her favourite magazine – Woman’s Day – she virtually shouted it from the rooftops. Even when her memory faded, she never forgot to boast about me. Bits and pieces of her life surround me now. Her old photos are crowded on her old sideboard in my living room. Tea towels once used to dry dishes after her Sunday roasts are now in my kitchen drawer. A crocheted doily has become a parachute for Sprog 2′s toys. I love you Nan. I promise I’ll plant a sea of flannel flowers one day in your memory. This entry was posted in LIFE and tagged flannel flowers, slide night. Bookmark the permalink. Those two pictures of you and your Nan are amazing, Alana! How glad you must be that you have them. I have a few things that belonged to my grandmother too. We used to write to each other regularly and her letters were always written in blue flowing ink. I still have many of them and rereading her words instantly brings her to life. I miss her too. I would have loved her to meet my younger two boys. What a beautiful tribute to your grandmother, Alana. Grandparents are such a special, important part of a child’s life. Most of my beautiful childhood memories feature my grandparents. My last surviving grandparent died more than 30 years ago but I often think about her and always with love. Btw, there are lots of flannel flowers on the Central Coast. I saw them a few weeks ago. Alana, my Mum & Dad moved to Hawkes Nest a few years ago after my Nanna passesd away. My Nanna was very similar to yours – very giving, a place where I spent many holidays with and to this day I still have her dining room table in my hous (my inheritance). Family in our lives is so special and continues to be. It was just last weekend I was up at Mum & Dads, chatting with my brother & my Goddaughter (neice – the red headed Lucy). Mum had some of the most beautiful roses growing in her front gardens – something she could never grow in Adamstown Heights. TAKE CARE!!!! Its bloody Hawks Nest sorry Alana. You would think I would be a better speller having had Mrs Harvey, Mrs Malinoski, Mr Coobes & Miss Stevenson!!!!! Oh, I loved Mrs Mal so much. And Mr Coombes was a special man. Poor bloke. Still remember kids making fun of him when he lost his hair. Awful. I know! It freaked me out to find that little photo book, with the pics side by side.